Pacing an autistic runner in the Long Island marathon (2013). His coaches dropped out of the race early as they were not well and I had to run the rest of the race with him solo (with his brother on a bike for support). The runner had only run NYC and Boston previously, and had no experience running a race with sections of minimal to no crowd support. I had to be a cheerleader aside from pacing for the last 18 miles. It was exhausting and thrilling to help him reach the finish line. 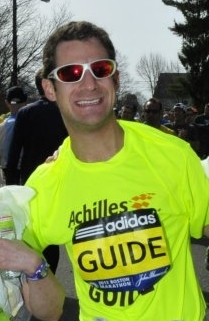 I recently paced an autistic runner in the Boston Marathon (2013). I was a last minute addition to his pacing team and it gave me the confidence to join and volunteer other pacing teams and assist runners with special needs.